There’s no exact retail value for a domain name. Just like there’s no exact value for a physical piece of real estate. Period. If you wanted to sell your home and you asked three Realtors to value your home, they would go into the Multiple Listing Service and pull from the past couple of years all the sales in your neighborhood of homes similar to yours in geography and size. Then they’d physically walk into your home and see how it compares to what has sold by characteristics: number of bedrooms, number of bathrooms, square feet of house and lot, quality of finishes, and other characteristics. Only then would they be able to give you a suggested listing price. And it would likely not be an exact price but a range, like $240,000 to $255,000 or $500,000 to $542,000. In addition, you might have to look wider. If you can’t find a 1,200 square foot home on a half acre in the 98110 zip code in the past two years, maybe you need to look back past the last recession to when the market matched the current financial landscape to find comparables, or look in the neighboring zip code. There’s a similar valuation methodology for domain names. You start with comparable sales in the same industry, the same character count, using the same or similar words. But because domain names are less liquid than physical real estate and because there are likely less comparable sales, the valuation range is larger to accommodate the increase in uncertainty. As you might only look one, two, or three years back in real estate, with domain names you might look five, six or seven years back to the last financial cycle. If the market is bad right now, maybe you need to go back to the last recession or financial dip to see what sold back then and for how much. And it’s — what I refer to as an — order of magnitude — that you’re looking for. You’re looking for a range. Is it a $1, $10, $100, $1,000, $10,000, $100,000, $1,000,000 domain name? If I own the four character domain name Sumo.com, it’s CLEARLY not a $1,000 domain. It’s not a $10,000 domain. It’s likely not a $100,000 domain unless you’re buying it wholesale. Retail, it’s likely a six figure domain name. Go watch the Sumo.com interview on DomainSherpa. Most domain name brokers would have priced the domain name at an order of magnitude of maybe $400,000 or $500,000, but Noah Kagan paid $1.5 million for it because he had the highest and best use case for the domain name. So — as a domain name investor — you have to roll up your sleeves, look at the domain in detail, evaluate all of the 17 characteristics to value a domain name, look at the comps, figure out the highest and best use case, and THEN determine your order of magnitude domain name price. 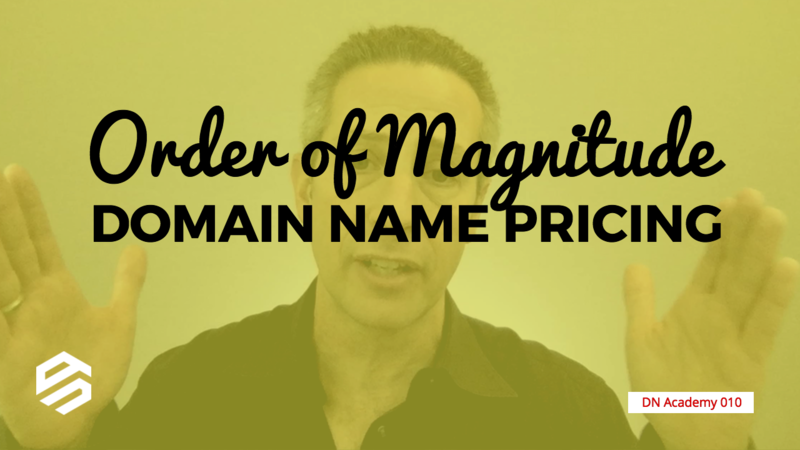 A proper order of magnitude domain name valuation should always be your starting point for every negotiation. Very useful information. Thanks, Michael! Great video man. I agree, Sumo.com is definitely not a $1.5M domain name, but you know what – I spoke about using peoples ego’s against them during negotiations, and in this case – it totally worked. I also think the previous owner who paid $150k for Sumo.com back in 2008 overpaid for it.. Regardless, that goes to further make your point – there is no exact pricing, everyone has a different view, but as long as you have a solid grasp on potential value ranges – you’ll be alright. Am I able to download the list of 17 domain characteristics? Great and useful insight as always Michael. I don’t want this thread degrading into people posting their domains and asking for free valuations, so I removed your domain names from your post. You’ve been through the DNAcademy course, so you understand all 17 characteristics that impact the valuation of a domain name. Please do your own valuation and then email it to me, and I will be happy to provide you my valuation in return so you can compare the two. If you don’t have my email address in your archive, you can reach me at https://www.dnacademy.com/contact.